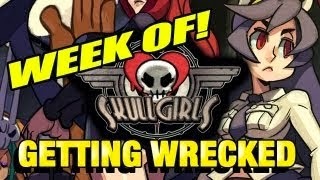 Maximilian is "getting wrecked" in Skullgirls. Watch part five of the mauling inside. Five parts to Maximilian's "WEEK OF!" Skulgirls have now been completed. If you want to watch the first four parts, click here, here and here. Posted by Fernando Quiles Jr. The New 52 costumes for Injustice: Gods Among Us have been revealed. See Superman's New 52 attire inside. New Sony handheld to be renamed Vita?